Back: Breathe in me, Holy Spirit, that my thoughts may all be holy. Move in me, Holy Spirit, that my work, too, may be holy. Attract my heart, Holy Spirit, that I may love only what is holy. Strengthen me, Holy Spirit, that I may defend all that is holy. Protect me, Holy Spirit, that I may always be holy. 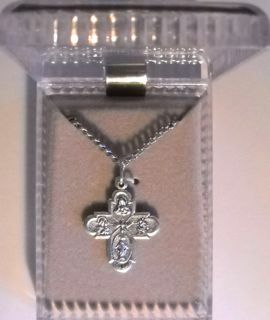 Silver Embossed Pewter Saints Medals and Chains - $9.75 ea. 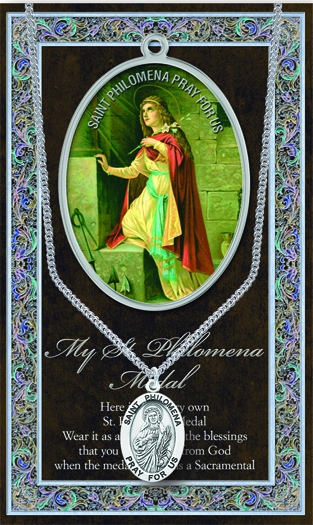 Saint Philomena 1.125 in. Genuine Pewter Saint Medal with 18 in. Stainless Steel Chain. Silver Embossed Pamphlet with Patron Saint Information and Prayer Included. 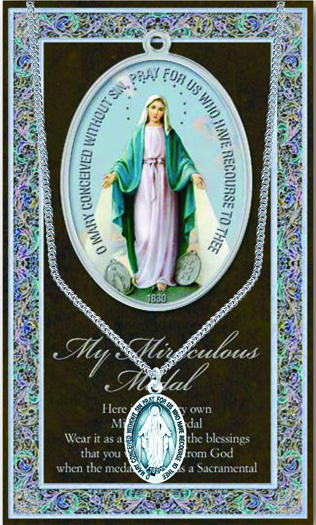 Mary-Miraculous 1.125" Genuine Pewter Saint Medal with Stainless Steel Chain. Silver Embossed Pamphlet with Patron Saint Information and Prayer Included. Saint Michael 1.125 in. Genuine Pewter Saint Medal with 18 in. Stainless Steel Chain. Silver Embossed Pamphlet with Patron Saint Information and Prayer Included. 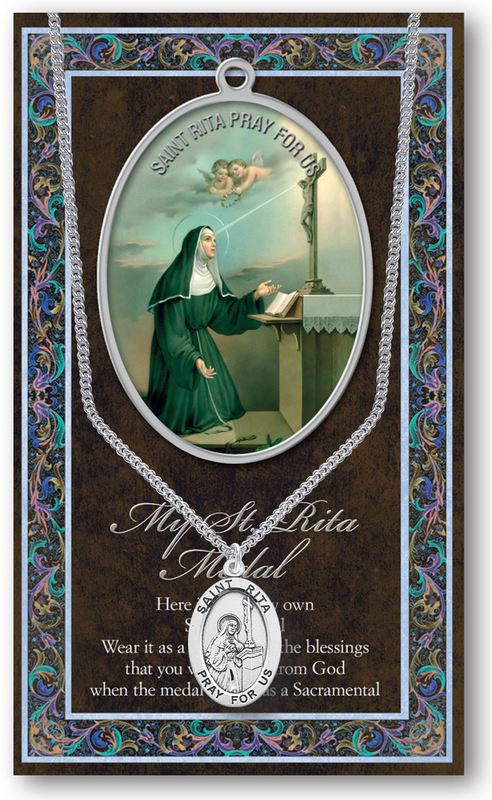 Saint Rita 1.125" Genuine Pewter Saint Medal with Stainless Steel Chain. Silver Embossed Pamphlet with Patron Saint Information and Prayer Included. Saint Sebastian 1.125" Genuine Pewter Saint Medal with Stainless Steel Chain. Silver Embossed Pamphlet with Patron Saint Information and Prayer Included. 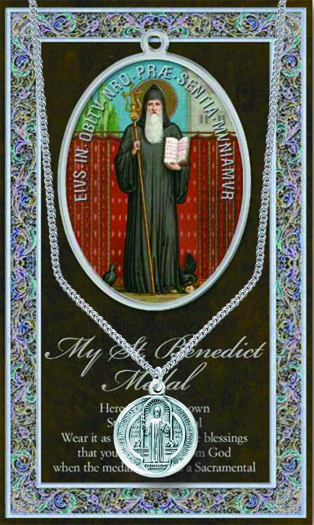 Saint Benedict 1.125" Genuine Pewter Saint Medal with Stainless Steel Chain. Silver Embossed Pamphlet with Patron Saint Information and Prayer Included. Saint David 1.125" Genuine Pewter Saint Medal with Stainless Steel Chain. Silver Embossed Pamphlet with Patron Saint Information and Prayer Included. 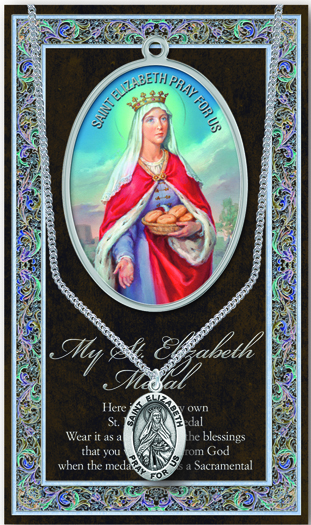 Saint Elizabeth 1.125" Genuine Pewter Saint Medal with Stainless Steel Chain. Silver Embossed Pamphlet with Patron Saint Information and Prayer Included. 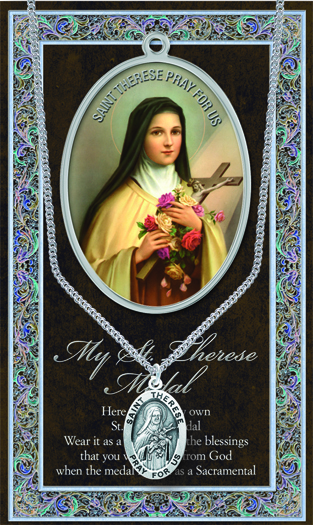 Saint Therese 1.125" Genuine Pewter Saint Medal with Stainless Steel Chain. Silver Embossed Pamphlet with Patron Saint Information and Prayer Included. 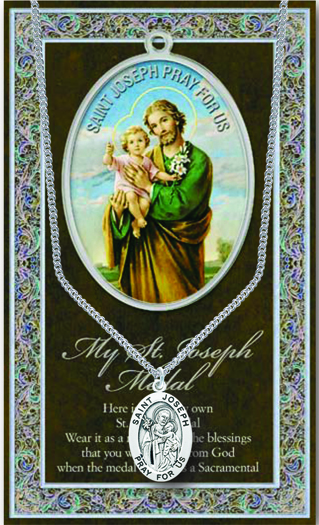 Saint Joseph 1.125" Genuine Pewter Saint Medal with Stainless Steel Chain. Silver Embossed Pamphlet with Patron Saint Information and Prayer Included. 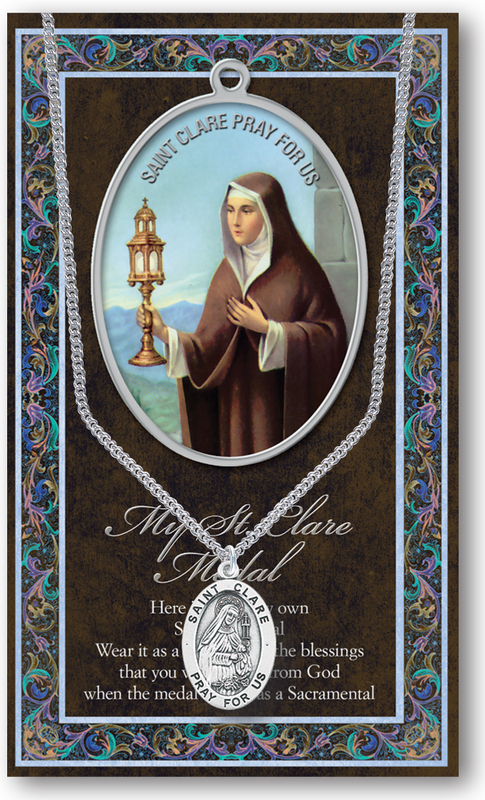 Saint Clare 1.125" Genuine Pewter Saint Medal with Stainless Steel Chain. Silver Embossed Pamphlet with Patron Saint Information and Prayer Included. 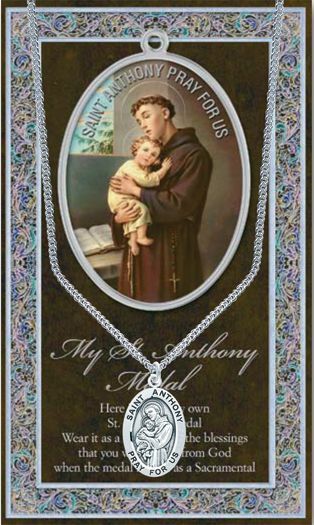 Saint Anthony 1.125" Genuine Pewter Saint Medal with Stainless Steel Chain. Silver Embossed Pamphlet with Patron Saint Information and Prayer Included. 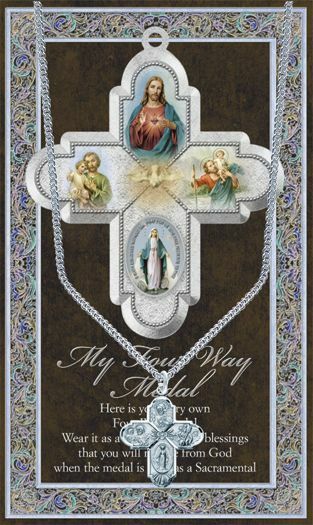 Four Way Cross - 1.125" Genuine Pewter Medal with Stainless Steel Chain. 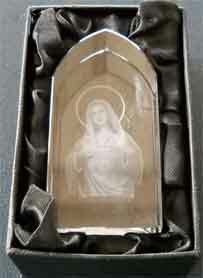 Silver Embossed Pamphlet with Patron Saint Information and Prayer Included. 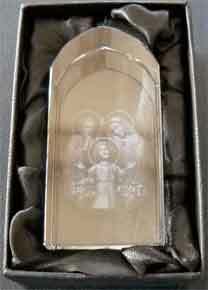 Etched Glass Inspirational Gifts - $14.00 ea. Books By Fr. 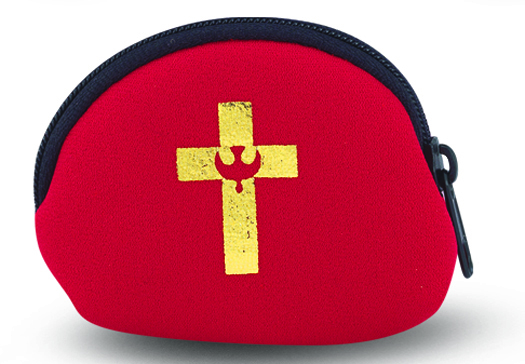 Lasance - Great Confirmation Gifts! 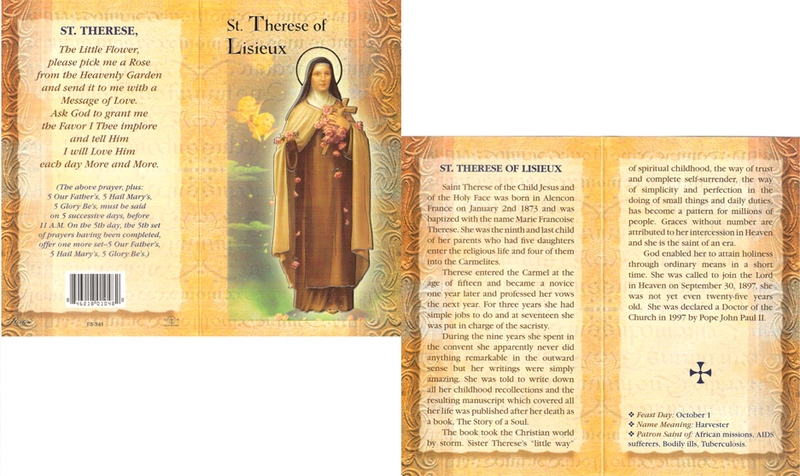 My Prayer Book - filled with a Catholic Treasure Chest of traditional reflections, counself, prayers and devotions, Fr. Lasance's My Prayer Book has been a favorite of Engliksh-speaking Catholics for almost a century. 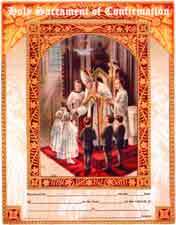 First published in 1908, this a wonderful and comprehensive source of Catholic prayer. 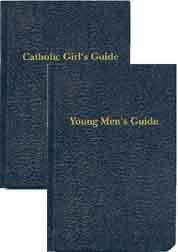 An ideal guide for young men and women was written by Fr. Lasance some years ago. The Catholic Girls Guide and Young Men's Guide are ideal gifts for young people who are striving to find a proper balance between the world and their faith. Filled with sound counsel and the prayers which have guided young men and women for centuries, these are the guide's the young people in your life should have available to them. How many times have we said, "They just won't listen to me." Well, let them hear the proper counsel from the Saints of the Church. by Walter Farrell, O.P., S.T.M., and Martin J. Healy, S.T.D. is a pocket edition of the Summa of St. Thomas Aquinas. Here the Summa is presented in a simplified form. This vast summary of Thomistic teaching which deals with every worthwhile truth from a to z, from the attributes of God to the zeal of man has been distilled into this little volume. It is, in truth, a miniature and simple Summa for every man. 650 pages. To order My Way of Life using PayPal click on the icon below. -is a summary of spiritual doctrine so simplified and arranged that everyone can come to a knowledge and practice of the principles of the spiritual life. It is divided into three books which treat respectively of the three ways of the Spiritual Life. (1) Purification -- we must reform that which has been deformed in us by sin. (2) Imitation -- we must conform to Christ that which has been reformed. (3) Union -- we must transform through Christ that which has been condemned. This book must be read, not only with the head, but with the heart. We must think and pray. This daily exercise will transform belief into realization, theory into practice. This work is authored by Rev. Anthony J. Paone, S.J. It is an invaluable guide to spiritual growth. To order My Daily Bread using PayPal click on the icon below. by Rev. James E. Sullivan, MS. "My Meditation on the Gospel" offers short but fruitful reflections on the life and teachings of Christ. "Let us meditate on the Gosepls" urges Blessed Pope John XXIII. "Amidst the confusion of so many human words, the Gospel is the only voice that enlightens, draws, comforts, quenches thirst." This book must be read not only with the head but with the heart. We must think and pray. to understand the Gospel fully, we must live the Gospel. to learn Christ, we must lvie Christ. (Rt. Rev. Msgr.) Joseph B. Frey.Read. Reflect. Pray. 627 pages. To order My Meditation on the Gospel using PayPal click on the icon below. Read. Reflect. Pray. 560 pages. To order My Meditations on St. Paul using PayPal click on the icon below. by Anthony J. Paone, SJ Do not expect to read this book as you might read most other books. It is designed to give more than mere information. It offers the reader a broader understanding and deeper appreciation of human nature as it operates within him and in those with whom he must deal. It is calculated to enlarge the reader's view of human behavior and strengthen his ability to deal more realistically with others. This book tries to help the reader get the most out of daily life. It is a guide to greater peace of mind and increased spiritual vitality. Its ultimate goal iws a "more satisfying self-possession and a more enlightened self-management throughout this earthly life." To absorb its message into your very being will require time, reflection, application, and persevering practice. We would recommend the advice of Francis Bacon: "Read not to contradict and confute... but to weigh and consider. Read. Reflect. Pray. 315 pages. To order My Daily Life using PayPal click on the icon below. by Thomas a Kempis needs no introduction. For five centuries it has been the most popular spiritual book second only to the Sacred Scriptures. It presents the fundamental principles of the spiritual life. The Christian soul is invited to follow Christ Who is the Way, the Truth and the Life. As one studies the content of this marvelous work one become convinnced that without the Way there is no going, without the Truth there is no knowing, without the Life there is no real living. 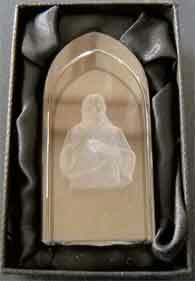 To order Imitation of Christ using PayPal click on the icon below.